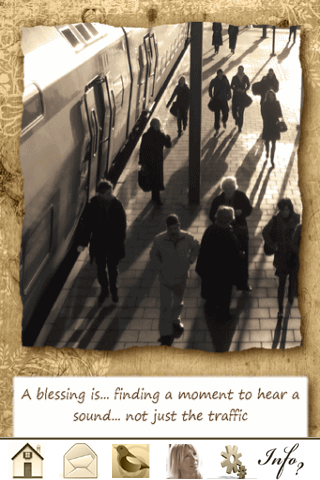 The Cards of Blessings is a set of 26 inspiring cards that come up at random at a shake of the iPhone or a tap on the screen. The Cards of Blessings by Lizzi Vandorpe is a set of inspirational cards which can be viewed sequentially. Alternatively, you can shake your iPhone/iPod touch to get a card at random. While viewing a card, you can tap the left or the right of the screen to be taken to the previous/next card. Additionally, if you tap the center of the screen while viewing a card, a toolbar will appear which gives you extra options like the ability to email a card to a friend or to Tweet about it.